Innovative light-diffusing window fashions from Hunter Douglas turn harsh rays into a soft glow. Discover this perfect light and save with valuable rebates starting at $100 on qualifying purchases. Spring is here! And so comes the power of light. What better time to evaluate your home’s window treatments and consider how Hunter Douglas window fashions can transform the light in your rooms. Hi, I’m Phil from Aria On-Site, and the Celebration of Light Savings Event will help you set the sunny scene with rebate savings on select Hunter Douglas styles. During the Celebration of Light Savings Event, you can take advantage of valuable rebates, now through June 24th, on several styles of light-diffusing window fashions. 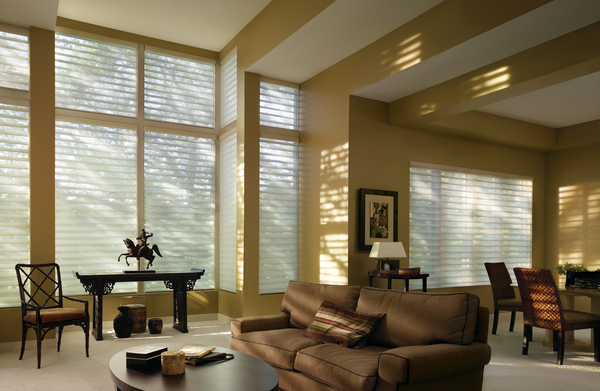 See the beautiful glow that the filtering sheers of Silhouette® Window Shadings produce. Experience how Pirouette® Shadings transform the sun’s bright rays into soft, ambient light. Best of all you can fill your home with these light-transforming window fashions for less during the Hunter Douglas Celebration of Light Savings Event, on now through June 24th. Limitations and restrictions apply. Call for details.